Departure from our office in the center of Paris, where you will meet your guide. He or she will take you straight to the famous Louvre Museum right opposite our office. Your guide will take you through this must-see museum and tell you about the main artworks: the Venus of Milo statue representing the goddess Aphrodite, the impressive painting of The Wedding at Cana, the Coronation of Napoleon illustrating the emperor’s crowning in the Notre-Dame Cathedral, and Leonardo da Vinci’s famous Mona Lisa which is the most visited work in the Museum. After your tour of the Louvre Museum which takes about 1.30 hours, your guide will take you to the river bank, before the Pont du Carrousel, to board a Batobus boat. The boat will take you to the Eiffel Tower where lunch awaits you. This short cruise will show you Paris from a different angle. You will see some of the superb bridges over the Seine and Paris monuments along the banks. The boat moors at the Quai de la Bourdonnais at the foot of the Trocadéro, right opposite the Iron Lady. Your guide will let you disembark to go to the "58 tour Eiffel" restaurant. Your guide will then take you back to the river shuttle. After about 20 minutes of cruising on the Seine, the boat arrives at the foot of the Île de la Cité in the historic center of Paris. 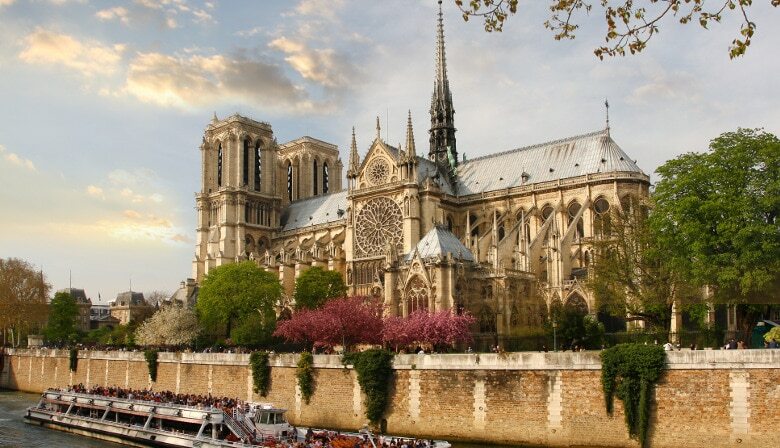 Walk up to the esplanade of the Notre-Dame Cathedral to behold this masterpiece of Gothic architecture built between 1163 and 1345, with its spires and famous gargoyles. After telling you about the facade, you can take a guided tour inside followed by free time to walk around and look at the superb stained-glass and rose windows. The highlights of Paris (Visit of Louvre Museum, Boat Cruise, Lunch at Eiffel Tower, Visit of Notre Dame Cathedral) in a nice and quite relaxing way. No stress in the traffic, short walking distances, free time at the Eiffel Tower after lunch, end at the most beautiful church in Paris with possibilities to keep on visiting, after the guided tour and at your pace, the Latin Quarter or the Marais district or just taste a wonderful ice cream at Berthillon in St Louis island. A must in Paris! Perfect pace, very knowledgeable, easy to comprehend his english. Overall, outstanding time. It was the best tour ever! Paris is a very beautiful city with lots of things to do, and I think that the tour showed me the most important attractions, in a way that I could have seen the important parts of Notre Dame, Tour Eiffel, the Seine, Louvre Museum. Also, many thanks to the guide, she was great, offered me many information, she was funny and friendly, I loved her and the tour! I would totally recommend it!!!!! Excellent way to see lots in a day. Guide fantastic. Lunch great. Worth doing if you are short of time or not.